You are here: ▶️ Home » Flat Roof Repair » Silver Roof Coating / Aluminum Asphalt Paint » Which Silver Coating or Asphalt Aluminum Paint to use? The question is which brand Silver Coating to use when it comes to protecting your roof against Ultraviolet. It is important to protect your roof against Ultraviolet. Modified Bitumen Torch Down Rubber membrane without ceramic granules must be coated with this silver paint. 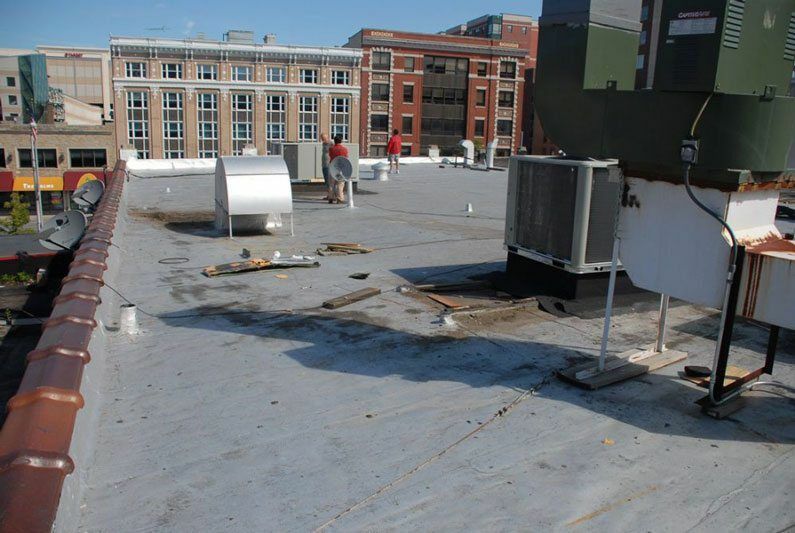 The old hot asphalt tar roofs also needed to have protection and the same Asphalt Aluminum Paint was used. There are many brands of Silver Paint that can be purchased at Home Depot or Lowes or a local Hardware store. Unfortunately, these are the cheaper brands and does not last very long. It is better to go with a better brand and have your roof protected for a longer period. Silver Paint or Aluminum Asphalt coating to protect your roof against ultraviolet degradation. 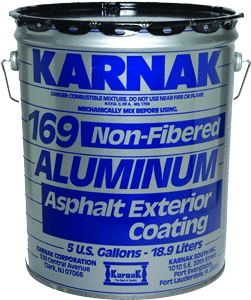 Karnak provides the best Silver Coating for and Asphalt based roof. We have been using Karnak for over 30 years and never had any issues. We recommend the Non-Fibrated silver paint. As all aluminum silver paints, while applying this paint, you have to stir it almost every minute with a paint stirrer attached to a cordless drill or screw gun. The reason is that the aluminum flakes that are in the asphalt solution sinks or settles to the bottom very rapidly. There are many brands that can be bought at the nearest Home Depot or Lowes. These brands are usually not the same quality that you buy at a roofing supply. 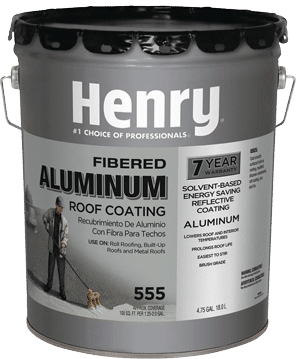 Henry-Fibered Silver Paint can be used if you don’t have access to a roofing supply house. 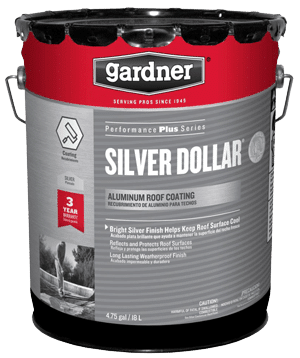 Gardner Silver Dollar is a good brand. If you can’t find Karnak, then Gardner is also a good choice of Asphalt Roofing Paint. All these roof coatings will do the job. 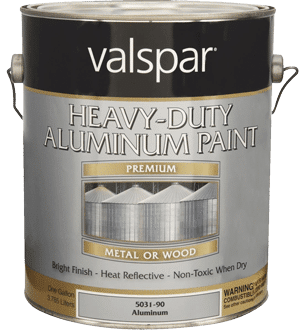 Valspar Aluminum Paint is not to be used on roofs. 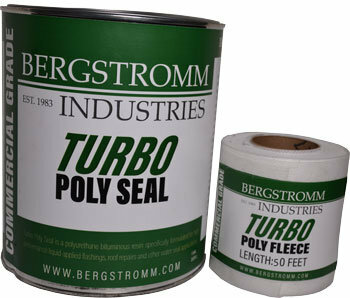 This silver paint does not have the asphalt bonding properties like the other coatings. 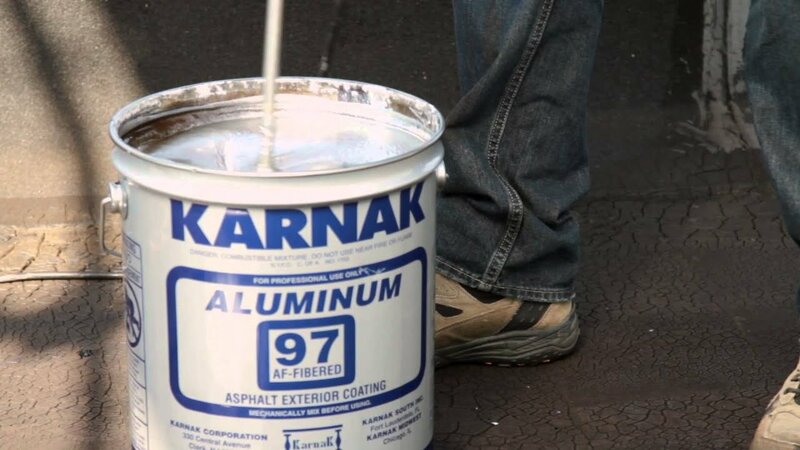 Watch this video on how to apply Aluminum Asphalt Paint to an Asphalt Roof. These coatings or paints are not to be used to fix a leaky roof. So often we see people apply these silver coatings to seal a leaky roof. Before you consider to paint your roof with Aluminum Paint or Silver Paint, you must make sure it is free from any leaks. It is very hard to make roof repairs after the Silver paint has been applied. It is even harder to find the leaky areas after coating the roof. Silver Paint or Aluminum Asphalt Paint is a reflective coating to protect the rubber membrane against Ultraviolets. It is not to stop leaks. This Modified Bitumen Torch Down rubber Membrane has lasted over 30 years because it was protected against ultraviolet with silver coating.